ID: Hard tube coated with sandy. Fine lavender plume. 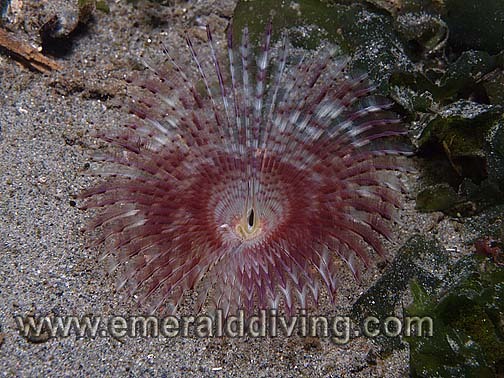 Comments: I have only noted this inconspicuous tube worm while diving the San Juan Islands. This worm uses the surrounding sand when constructing its tube for camoflage and fortification. Photo taken at Peapod Rocks in Roasrio Strait. 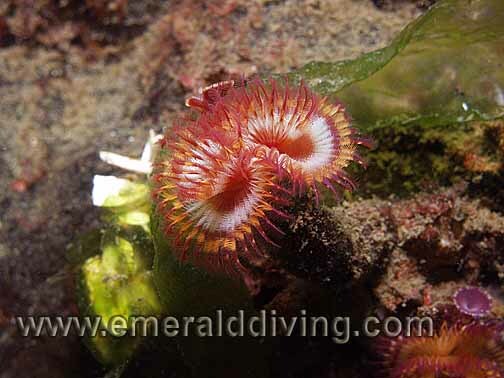 Comments: I note this tube worm quite often in the San Juans when diving rocky reefs. 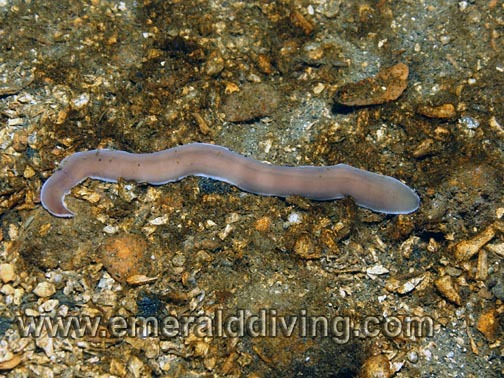 The purple encrustation that co-habitates with this worms is corraline algea. 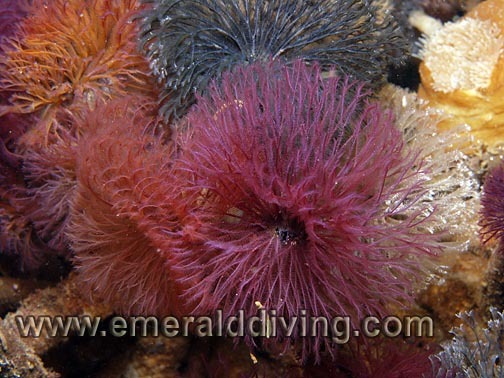 ID: Distinctive black and maroon colored plume. Hard, brown tube. 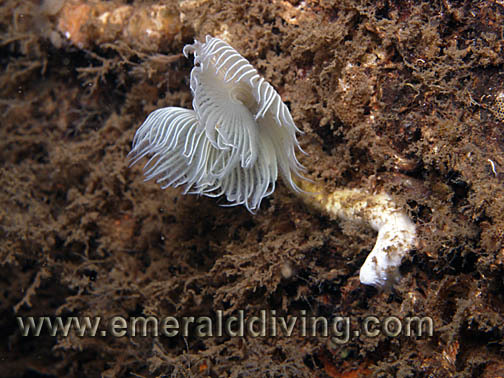 Comments: Feather duster tube worms are common throughout the Northwest waters. 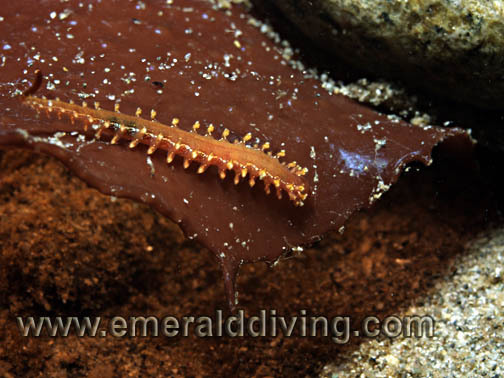 This tube worm often attaches itself to the underside of docks. 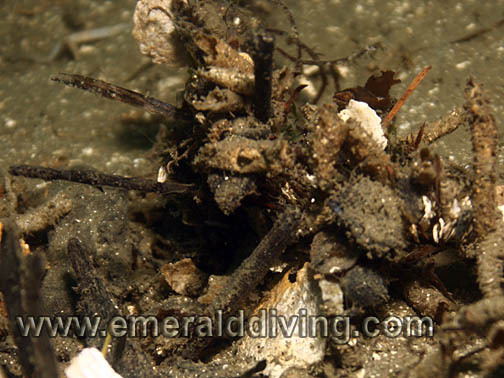 Amazing colonies of this worm are readily found clinging to may of the buoy anchor lines in Edmonds Underwater Park. This worm retracts its flambuoyant plumage into its tough tube when approached. ID: Colored plume - typically solid orange, yellow, or white. Plume "feathers" do not branch. Comments: I typically find this beautiful feather duster worm in isolation throughout Washington waters. 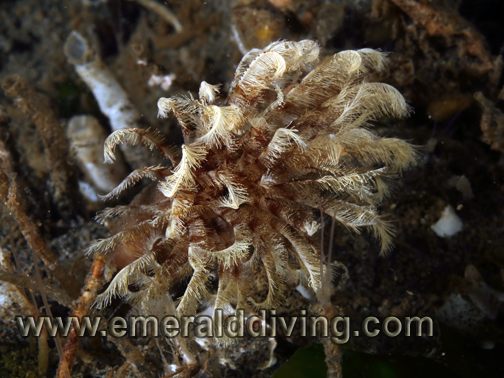 Another species of feather duster worm is very similar in appearance, but tends to grow in colonies and has plume feathers that branch. Photo taken at Three Tree Point in Puget Sound. ID: Distinctive plume varies in color from light to dark purple. Retracts quickly when approached in a gelatinous looking tube. 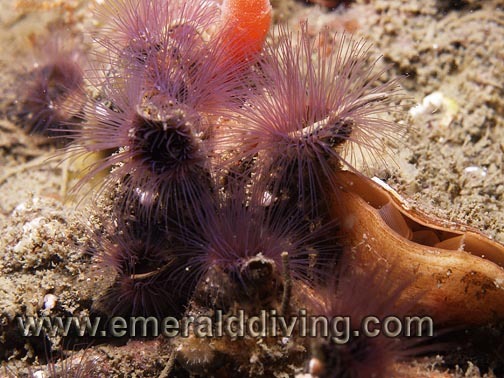 Comments: The unusual slime tube worm is readily found on soft substrates. 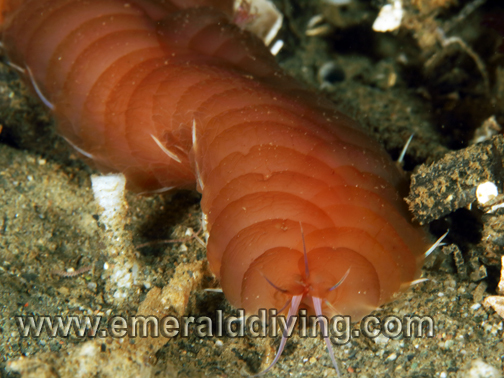 I usually note this worm living in colonies with 5-20 others slime tube worms. Less often I find lone specimens, as pictured here. 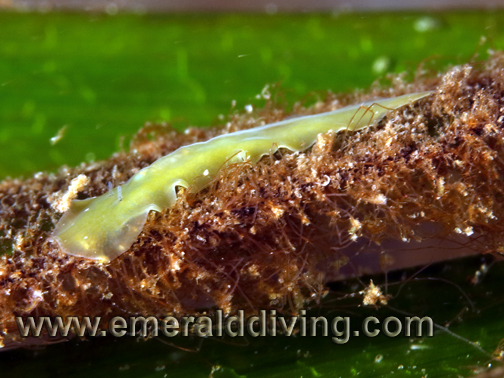 The slime tube worm retracts very quickly into a semi-transparent gelantenous-like tube when approached. ID: Radial plume. Color varies highly, but is usually (but not always) solid. Distinctive branching in plumes. 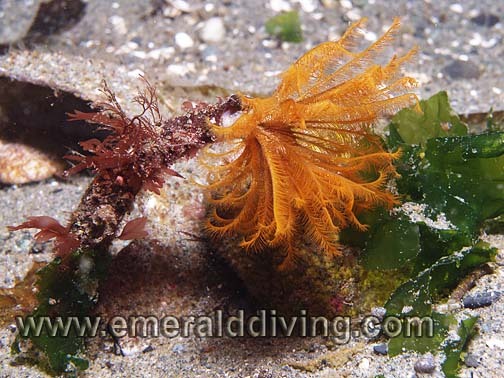 Comments: This beautiful feather duster is another common inhabitant of northwest waters. I usually find it growing in dense colonies. Many of the ropes anchoring marker buoys at Edmonds Underwater Park (which is where this photo was taken) are infested with these thriving colonies of these worms. ID: Radial plume in red and white. Retracts quickly when approached in a gelatinous looking tube. Usually isolated. Comments: This worm is a fairly common inhabitant of sandy substrates. Although it is referred to as a twin-eyed feather duster won, it's radial plume reportedly contains up to a thousand tiny eyes that can sense shadows. 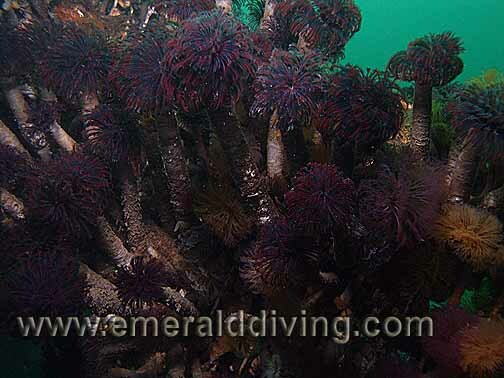 Photograph taken at KVI Tower Reef in central Puget Sound. ID: White tube, although often encrusted. Red plume with white and yellow bands. Comments: This colorful worm is common throughout Washington waters. It quickly retracts into its tube anytime a diver aproaches, leaving the diver to wonder what all the curved, white empty tunes are that litter the bottom. ID: Hard white tube. Two elegant white plumes which spiral outwards from the body. Comments: This worm is extremely sensitive and usually retracts quickly when approached. This worm is relatively common throughout Washington waters. Photographed at Three Tree Point in central Puget Sound. ID: Long, thin tentacle like strand emanating from a common source . 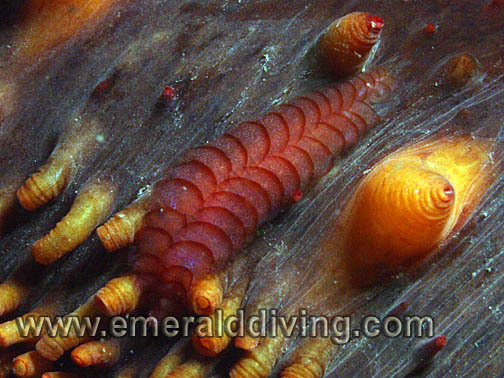 Comments: The body of this worm is hidden in the sediment; only the tentacles are visible to a passing diver. The worms tentacles create a web-like appearance and lie in wait for unsuspecting prey. Photographed in Barkley Sound, British Columbia. ID: Light brown colorarion with smooth, white margin surrounding entire body. Tapered at tail end. Comments: This worm is a relatively rare find for me, but a favorite as the light edged ribbon worm is an accomplished swimmer when distiburbed. Photographed inside the drydock at Edmonds Underwater Park (which is always full of surprises). ID: Smooth scales, subtle reddish patch on rear. Comments: This worm typically lives on the underside of various invertebrates and has a commensal relationship with its host, defending it from would-be predators. Pictured here with a leather star (with some persuasion, the worm moved on top fo the seastart). Photographed at Norway Island in the Canadian Gulf Islands. ID: Red color, distinctive scales. 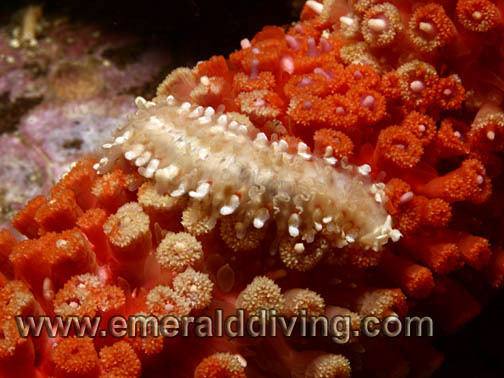 Comments: This worm is typically foound clinging to the tube feet of red sea cucumbers, although it has been noted on other invertebrates as well. Photographed at Norway Island in the Canadian Gulf Islands. ID: Fringed margin, color varies to match host. Comments: This specimen was found on the underside of a painted star, and we chased it to the top side so it stands out. 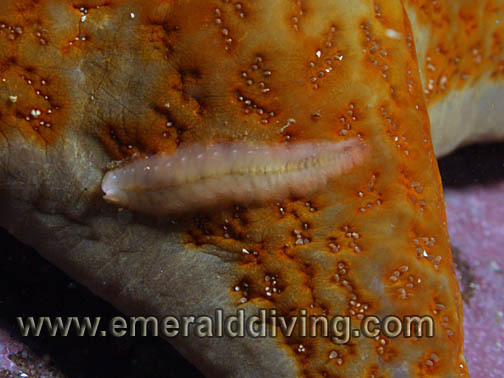 This commensal worm lives amongst the tube feet of various seastars. 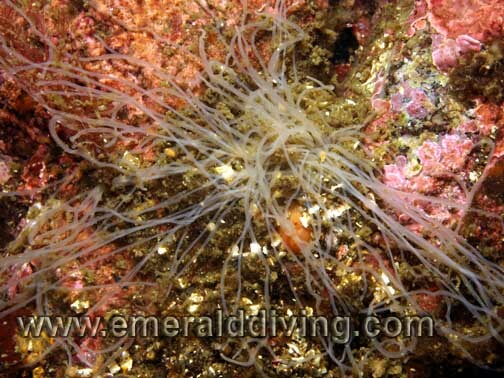 The fringed appearance mimics the tube feet of its host. Photographed at Norway Island in the Canadian guld Islands. ID: Stacked assortment of local marine debris around a hardened tube. Comments: Looking more like an abstract pile of bits and pieces, the orante tube decorates the exposed portion of it fortress with whatever it can find in its immediate surroundings. Photographed at Norway Island in the canadian Gulf Islands. 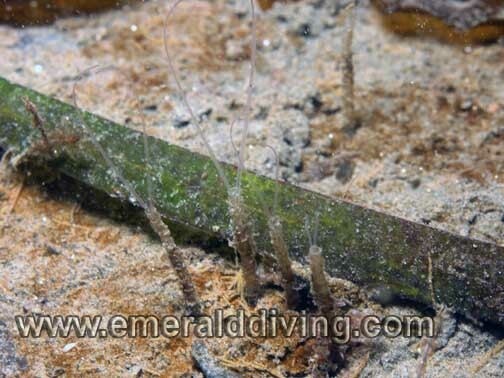 ID: Tough chitonous tube with two long palps which can be extended from the tube. Comments: I find these small and inconspicuous tube worms almost everywhere I can find a sand substrate, epsecially at shallower depths. This little worm is very quick to retracts when approached. Photographed near Race Rocks, British Columbia. ID: Ornate, fine plume - typically white and red-brown. Comments: Another of the common a beautiful marine worms of the Salish Sea. 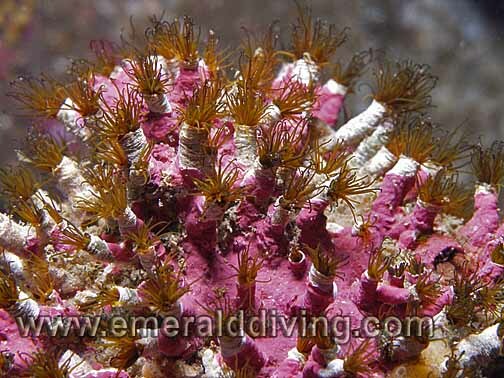 Typically found on silt-strewn substrates in isolation of one-another, but in the company of other tube worms. 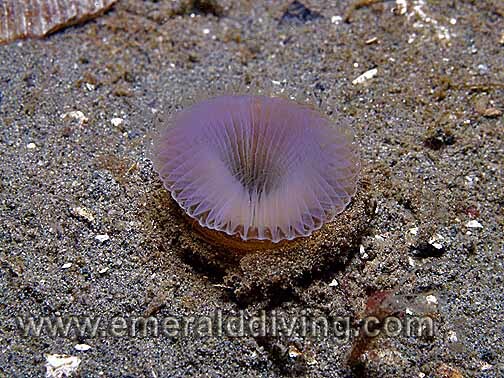 This species produces a jelly ring at the base of the tube for reproductive purposes. 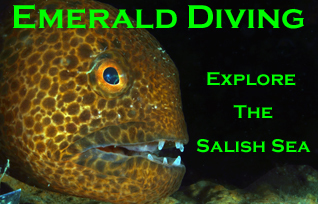 Photographed at Alki Reef, Puget Sound. ID: Distinctive large size and per the name, unique gelatinous fleshy scales. Comments: This large polycaete typically hides during the day, only making an appearance at night. The only site I have noted these worms is at Redondo Beach, which is where this specimen was photographed. ID: Flat profile, almost transparent green with what looks like a light green or white stripe of blotch that runs vertically. Comments: I only note this hard to spot flatworm when looking for Taylor's sea hares in eelgrass beds. This first time I saw one, I thought it was a sickly sea hare! Photographed at Alki Beach, Puget Sound.